The Jungle Book 2 is a fifty-cent slice of pie following the more filling, elegant meal that is the original film. Disney's relatively brief obsession with cash-in sequels churned out far more misses than hits, with Jungle Book 2 being one of the only direct-to-video-quality misfires in the bunch to make its debut in theaters... to the tune of $135 million no less. Regardless, it remains one of the studio's most unnecessary sequels and one of its most disappointing. Thin and tiresome, it tramples the original Jungle Book while adding nothing to the classic film's legacy. Sure, it's cute, decently animated even. But it's a plodding trip down memory lane more concerned with systematically recalling the past than forging a franchise future. Worse, it's dull, frivolous and by the numbers. It shouldn't have been released directly to video; it shouldn't have been green-lit at all. As Mowgli (voiced by Haley Joel Osment) grows accustomed to life in the "man-village," he cherishes his new best friend, Shanti (Mae Whitman), and little brother, Ranjan (Connor Funk). But he still has that jungle rhythm in his heart. He misses hanging out with happy-go-lucky Baloo (John Goodman) the bear and Bagheera (Bob Joles) the panther. Yearning for freedom, Mowgli runs off into the jungle, only to encounter his enemy Shere Khan (Tony Jay). This time, he'll need both his new human family and his old jungle friends to help save the day. The voice cast is strong, with Goodman, Osment, Whitman and Joles valiantly leading the pack. The story is promising too, with the further adventures of Mowgli affording screenwriter Karl Geurs and director Steve Trenbirth to explore fresh territory. That doesn't stop them from rehashing The Jungle Book, though -- sometimes beat for beat -- nor does it elevate the sequel above flimsy, forgettable children's entertainment. There isn't a real reason for Mowgli to plunge back into the jungle, other than the fact that the studio deems it necessary. The heart and spontaneity of the original film apparently weren't appealing enough either, as Geurs and Trenbirth go to great lengths to spiff up familiar elements, characters, locales and songs without realizing how fundamentally different each one has become in the process. Gone is the complexity in Mowgli and Baloo, replaced by contrivances and convention. Gone is the quasi-episodic nature of The Jungle Book, which hearkened back to Rudyard Kipling's books. Gone is the emotion. Gone is the magic. Gone is the seeming ease and effortlessness that came before. All that remains are several beloved characters, none of whom are treated with the respect they deserve, as well as endless reprisals of past scenes, past songs and past plots. It isn't hard to see why Disney chose to release The Jungle Book 2 theatrically -- it comes close to looking the part -- but it's a mystery to me as to how no one recognized how much its mediocrity and meanderings tarnish the original film. Your kids may enjoy the sugar rush, sure. Just don't convince yourself that it's good for them. The unmistakable highpoint of The Jungle Book 2 is its 1080p/AVC-encoded video presentation. Colors are lush, vibrant and striking, primaries flower and bloom, black levels are deep and inky, and contrast is dead on. Detail is excellent too, capturing the animators' efforts with near-perfect precision. The brushstrokes of the hand-painted backgrounds are lovely, the line art is crisp and free of ringing, and every personal touch is intact. A few instances of exceedingly minor banding make brief appearances, but it's nothing serious. Other issues are nowhere to be found, making The Jungle Book 2 one of the best-looking films of Disney's (almost entirely) direct-to-video sequel lineup. Disney's DTS-HD Master Audio 5.1 surround track delivers, even though the sequel's sound design isn't as full or rewarding as the studio's true theatrical classics. Voices are clear and intelligible at all times (despite a few float-y lines), effects are nicely spread across the soundfield, and the film's flashier, funnier moments make an impression. LFE output goes big and bold, latching onto any excuse to amp up the otherwise routine soundscape. The rear speakers have plenty of fun too, just not the sort of consistent fun that makes every environment as inviting as the last. Directionality is decent, pans are slick, and dynamics bolster every burst of music and outburst of song. Ultimately, the sequel may get lost in the jungle, but its AV presentation knows exactly where to go. Legacy of The Jungle Book: A look back at The Jungle Book (1967) and the balance between old and new the filmmakers tried to strike when creating The Jungle Book 2. Deleted Scenes: Two deleted scenes are included, "I Got You Beat" and "Braver," with introductions by executive vice president Sharon Morrill and senior vice president of music Matt Walker. Music Videos: "W-I-L-D" and "Jungle Rhythm." The Jungle Book Synopsis: Brush up on the plot of the first film. Sing-Along Track: Sing along with the movie, karaoke-style. Too harsh? Your kids'll love it; that's a near certainty. It's you I'm worried about, moms and dads. The Jungle Book 2 is a fifty-cent slice of pie following the more filling, elegant meal that is the original film. Other than the usual warm-fuzzies that come with nostalgia, the misguided sequel has little to give and even less to offer. Pass. Still here? At least rest easy in the knowledge that the Blu-ray edition is just about everything it should be. (Minus the supplements, which don't amount to anything remotely exciting or special. (Or new, for that matter.) The bulk of the burden rests on the AV presentation's shoulders, and it's fortunately a strong one. Skip it if you can. Rent it if you must. Buy it if you're a completest... or a glutton for sequel punishment. 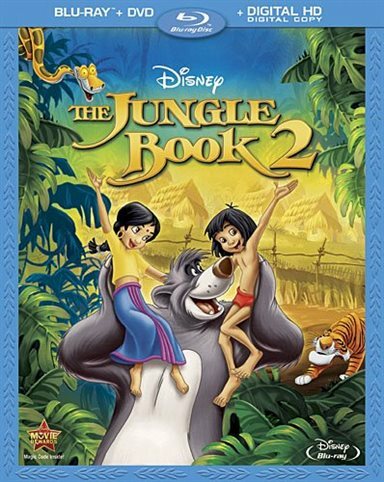 For more information about The Jungle Book 2 visit the FlickDirect Movie Database.